I have been meaning to try out Jennifer L. Armentrout's books for such a long time. When I heard she was coming out with a murder mystery it was about time I gave her a shot. I am so very glad that I did. 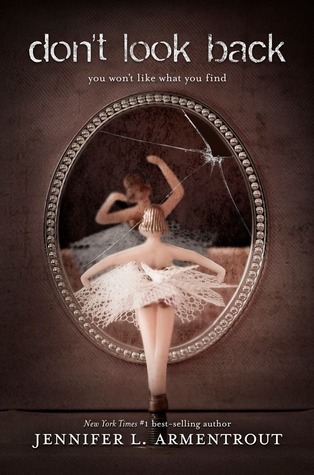 This is one of my favorite mystery's I have read in the young adult genre. The book grabbed me right from the start. It started off with the police finding Sam walking along a road beaten and bruised. She was immediately thrown back into the confusing world she does not remember. This made the story very intriguing. It was fast paced and I could not stop turning the page to find out the next missing piece of the puzzle. Armentrout took me on a roller coaster chase for the murderer. She made me believe it was so many people in the book but never the actually killer. When the killer was revealed I was completely shocked. This is what really makes a mystery book for me, whether or not I can figure the killer out on my own. It makes the book so much better if I cannot figure it out. One thing that usually falls apart in mystery books is the characters and character development but in Don't Look Back this did not happen. The main character Sam was a fully developed character and you got to see her change and grow throughout the book. There were also some fantastic relationships created in the book. I loved the brother-sister relationship between Sam and Scott. But most of all I loved the romance between Sam and Carson. There was a ton of romantic tension in the beginning and as you got to see the romance grow you fell harder and harder for them. By the time they kissed for the first time you were cheering like crazy. Don't Look Back is a page turning mystery full of intrigue, secrecy, twists and turns, and budding romance. A must read for any young adult mystery fan!